**NEW FOR 2019- Completely, well-renovated, upper level, 2BR, 2BA just steps to town! 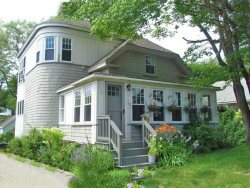 **This property can add on Harborside Studio anytime for additional space, however, from 6/29/19-8/31/19, tt will only be rented to Harborside View or Harborside Walk renters on a first come, first serve basis! DOGS PERMITTED? Sorry, Dogs are NOT permitted in this unit at this property. Located at the head of the harbor in Camden Village, this rental is the upper floor of a well appointed, triplex property located on Atlantic Avenue which places it in a very desirable part of town with shopping and restaurants just steps away. Next door to the property is the world-famous Camden Amphitheater Park and Library. All the nearby conveniences help make this a great home-base property. Tastefully decorated throughout, the layout is an open plan design with views of the harbor and town from the main living areas. The kitchen includes a convection toaster, full sized refrigerator, electric oven top, microwave and sink. It does not have an oven or dishwasher. The large, open living room has a new wall-mounted Smart TV with a DVD player as well as new comfortable couches and chairs for socializing and reminiscing about the days activities. There is a new King-sized Sleep Number bedroom with TV with shared en suite bathroom and a room with two twins. A new hall half bath as well is located outside of the kitchen area. Outside there is a gas grill on the north side of the house along.